1.1. The group gathers personal information from individuals and external organisations, all of which is recorded in documents and records, both in hard copy and electronic form. 1.2. Examples of the types of information accumulated and generated are set out in Appendix 1 of this policy and include membership details and other communications such as letters and emails. 1.3. In certain circumstances it will be necessary to retain documents for operational needs. Document retention is also required to preserve information. 1.4. It is however not practical or appropriate for the group to retain all records. Additionally, data protection principles require information to be as up to date and accurate as possible. It is therefore important that the group has in place systems for the timely and secure disposal of documents that are no longer required. 1.5. This Data Retention Policy has been adopted by the Commitee and is implemented on a day to day basis. 2.1. The group will adopt the retention and disposal guidance at Appendix 1 of this policy and strive to keep records up to date. Appendix 1 – Document Retention Schedule – Guidance on the recommended and statutory minimum retention periods for specific types of documents and records. 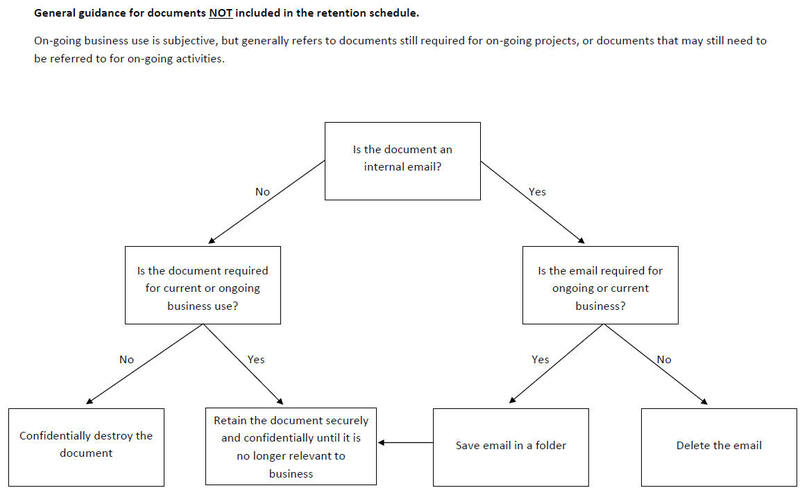 Appendix 2 – Quick Guide to document retention. 4.1. Documents containing personal information should be disposed of either by shredding. Such documentation is likely to include financial details and contact lists with names and addresses. 4.3. Electronic communications including email and all information stored digitally should also be reviewed and if no longer required, closed and/or deleted so as to be put beyond use. This should not be done simply by archiving, which is not the same as deletion. It will often be sufficient simply to delete the information, with no intention of ever using or accessing it again, despite the fact that it may still exist in the electronic ether. Information will be deemed to be put beyond use if the Group is not able, or will not attempt, to use it to inform any decision in respect of any individual or in a manner that affects the individual in any way and does not give any other organisation access to it. This Schedule may not be not exhaustive and any other record’s retention period should be reviewed at the time and added to this appendix.